Competition: Win 3 months of free VPS/Container hosting — Closed! 2013 was one of the best years in the history of bayton.org. Although there has been a continued interest in a number of my older posts such as this one from 2011 through search engines, I can attribute an increased number of views and interactions of a number of posts – old and new – to social sharing. Google+, Facebook and Linkedin are in my list of top referrers* all throughout 2013. In fact, aside from Google search, Google+ and Facebook ranked 2nd and 3rd in referral traffic respectfully, sitting above search engines such as Bing, Duck Duck Go, Yahoo and so on. That’s impressive! 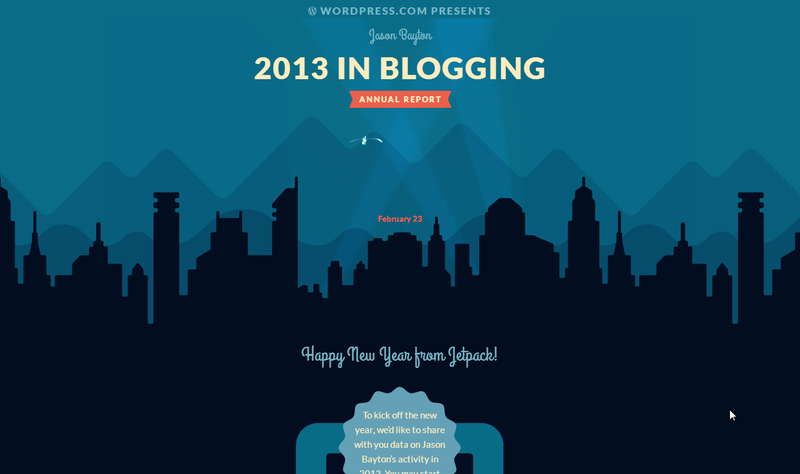 I use a combination of WordPress Jetpack and Google analytics to keep an eye on site statistics and each year WordPress, through Jetpack, send me a “year in review” that shows top posts, views, comments and more that I’ve uploaded below. Click on the image to be taken to the live microsite! Are you interested in social sharing? If you’re a WordPress user, Jetpack’s Publicize feature works flawlessly – even with Google+ profiles (not just pages as some services provide). Otherwise, you might find Dlvr.it or ifttt (If this then that) useful. Both of which use RSS feeds to publish posts to social networks. I’ve written previously about dlvr.it here, here, here and here. * Interestingly, Twitter is very low in that list. Perhaps that’ll change in 2014!